If they run a play for someone and he's open, he gets the ball. 1 passes to 4 in the middle of the floor (4 can attack off the dribble). 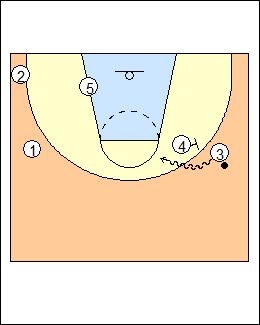 See Kentucky dribble-drive (slide entry). 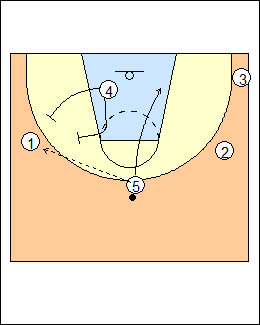 4 dribbles to the wing, 5 relocates and comes high, 3 goes under the basket. 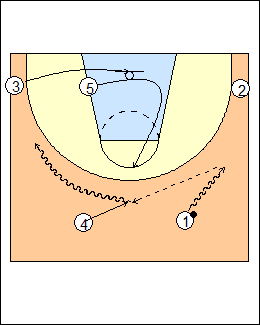 4 passes to 5, 4 and 2 screen for 3, 1 creates a passing lane (then goes opposite a pass). 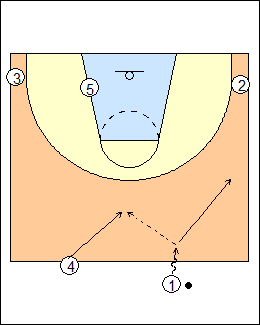 Drag option - 5 passes to 3 and dives, 1 and 2 space weakside, 4 ballscreens. 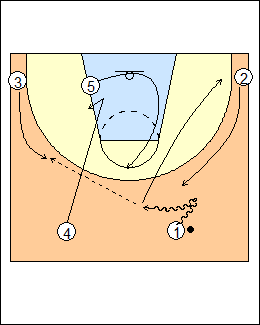 Drag is a screen by the 4-man, any fist is with the 5-man. 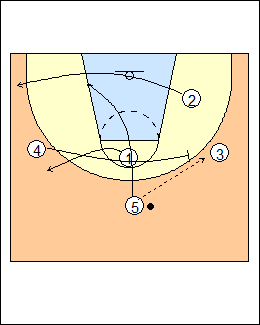 2 gets open for a pass, 1 clears, 4 gets open at the top, 5 relocates. 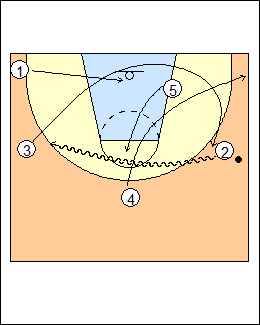 2 passes to 4 who dribble-clears 3, 5 comes high, 1 goes under the basket. 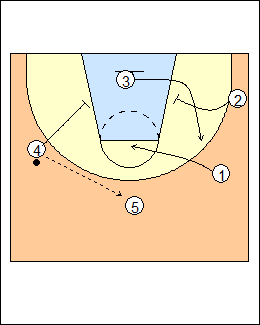 4 goes backdoor if denied, see below. 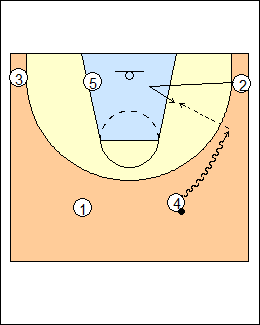 See Offence - 1-4 dive series, Quick hitters - Clear sets. On a pass to 5, 4 pins down for 1. 5 passes to 1 and dives. 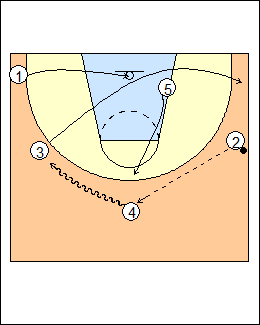 1 can yell "drag" for a screen by the 4-man (at either angle, if it's middle he comes to the elbow and out), if 1 yells "get" he's going to pass to 4 (e.g. coming up to the elbow). 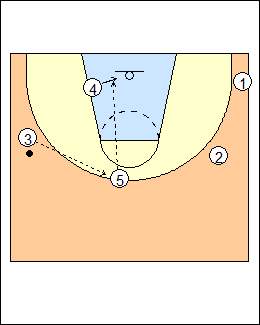 4 backcuts from the top if denied when 2 has the ball, 2 not 4 dribble clears 3. 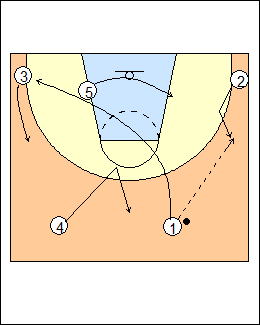 1 passes to 4 in the middle of the floor, 4 dribbles to the wing, 5 relocates and comes high, 3 gets under the basket. Pin-down on a pass to 5. 5 passes and dives, see above. 4 screens for 1 then gets a pass. 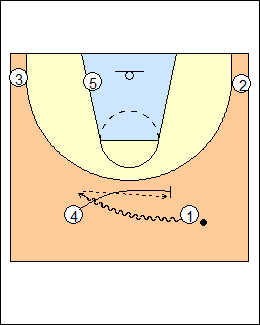 4 dribbles at 2 for a hand-off or backdoor or post-up (shown), it's 2's play. 1 spin dribbles, 5 relocates, 4 dives, 3 lifts for a pass, 5 comes high and 4 posts, 1 and 2 interchange. In the video, 5 does not dive if the pass goes to 4. 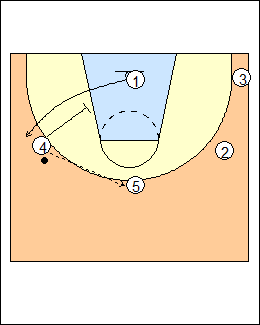 See Fast breaks - Larry Brown secondary (dive post), Triano early offence (dive), Quick hitters - Duke actions (Up, for an option if 3 calls Fist).